It's been three years since I've watched a Guttenberg film, so I'm a little out of the loop. Maybe it's the distance, maybe it's the holidays, I don't know. But I actually enjoyed this movie. And no, I am not proud of that. And yes, I am aware that this movie stars Jessica Simpson. It's Major Movie Star! This is a remake of the classic 1980 film Private Benjamin, and yes I am aware that I just said I actually liked a Jessica Simpson remake of an actual good film. But, this actually is a fun movie. Think what you will about J. Simp (as I like to call her), but she's a charming actress. She's not good, mind you. But she's charming. And in a film co-starring Steve Guttenberg, charming will get you an awfully long way. This film was never released in cinemas, but got a DVD release in the UK and the US. In the US, it's called Private Valentine: Blonde and Dangerous. You can see why I choose to ignore that wannabe Legally Blonde title, and go for the UK title. Simpson plays Megan Valentine, a movie star who joins the army after she attends the première of her bad film, finds out her staff hates her, discovers her uncle's been embezzling from her, and finds out her boyfriend is sleeping with her manager. Don't get me wrong, that's a bad day, but joining the army is a bit of a stretch. Our buddy Steve plays her agent, and is in a grand total of 5 scenes. He does get to be third billed though, after Simpson and Vivica A. Fox, who plays the sassy drill sergeant. So, that nice for him. Steve is a colour of tan that has never been seen in the natural world. He's like a dark, burnished, shiny walnut. It's quite stunning, in its way. He's the typical smarmy agent, with a heart of gold. Unlike all the other people in poor Megan's life, he actually has her best interests at heart. Sure, she wants to make serious films, and he pushes her towards talking animal films. But he's met her, and realises her capabilities. If anything, I think that speaks to his professionalism. He's just protecting her career. But perhaps that's me reading a little more into his character than you actually see on the screen. The absolute best thing about this film is the supporting cast, though. I literally said "OMG, it's that guy" like a dozen times. There's Lane from Gilmore Girls, that guy from Best In Show, that girl from Girlfriends, that guy from Scrubs, that guy who was Will's client on Will & Grace, and the always awesome Cheri Oteri. Seriously, a non-stop parade of supporting cast fun. And it has some very good throwaway comedy lines, which I actually laughed at. I think my favourite was from the drill sergeant when she arrives at the army base, and offers him a valium, so he can calm down: “I don’t do drugs! My body is a temple! Did you think that bus was going to a Phish concert?” Hee. A Phish concert. Anyway, if it's not obvious from the description so far, the army changes her and makes her a better person, she fires all the awful person, puts herself back together, blah, blah, blah. This is not really a film where "plot" is the most important element. Still, though. Enjoyable. Maybe it's the Christmas spirit. Maybe it's a three year break from the Guttenberg films. But I really did enjoy this movie. It's got nothing on the original (which, seriously, is a really good film, and you should watch it right away), but it's not awful. 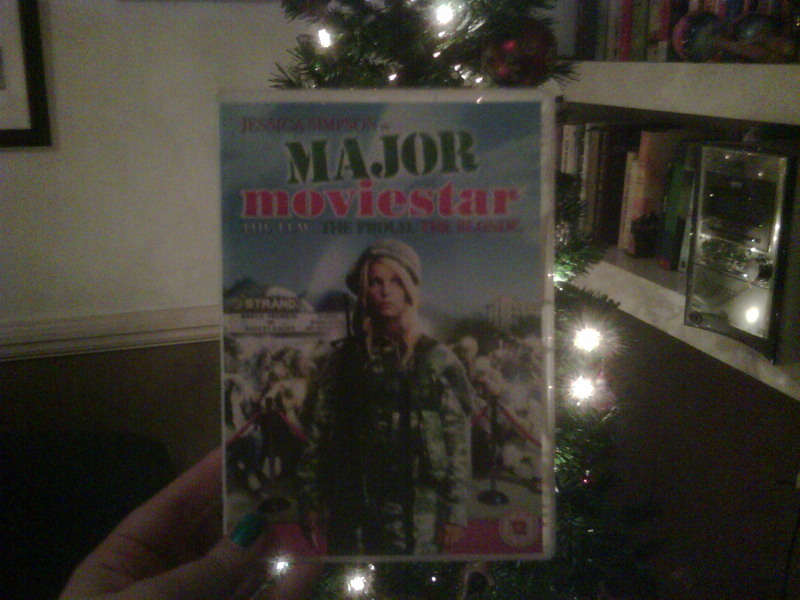 And "not awful" is saying an awful lot for a Jessica Simpson/Steve Guttenberg straight to DVD film. So, yeah, it's been 3 years since I've actually added a film to this list. Which seems crazy, does it not? Sorry about that. More importantly, I am not going to be a quitter with this. I promised you, people of the internet, that I would watch all of Steve Guttenberg's damn films, and I will do that. Now, when I started this, I neglected to think about the fact that, as a working actor, Steve-o continues to add to his body of work. Which means, that unless Steve retires, I will be watching Steve Guttenberg movies for the rest of my life. So, since the Guttenberg film list was last updated in 2007, I've made a few additions to the official list. It's up to date as of today. And it has 45 films on it now. The Gütt has been busy in the last three years. But enough of that sappiness! Back to the Guttenberg!